This symmetrical style sink unit gives you loads of storage space. 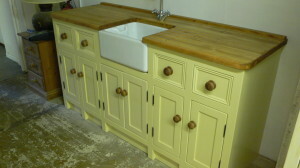 The unit has been painted in farrow and balls’ringwold ground’ with waxed handles on the doors and drawers. The 27mm pine worktop with 40mm upstand have been stained then treated with our waterproof wax making them durable.